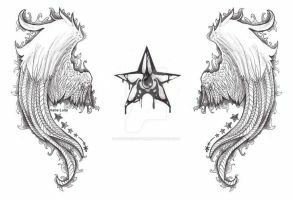 Angel wing tattoo design i made for a co-worker. Angel wings aren't really my kind of thing, but I tried to at least make them different from other ones that you see, hopefully not as trashy as so many of them are. I guess she's the one that has to have them covering her back for the rest of her life, not me. I think they're gorgeous. So different, yet recognizable for what they are. Wonderful!